Product ID: RH10 Nu. Perf. Ergonomics, even - oval handle design offers more power and less effort. Cushion grip provide unparalleled torque, comfort and control - even when damp or oily. Ratchet mechanism is all metal for durability. Engineered direction reversing switch is conveniently located for easy one hand operation. 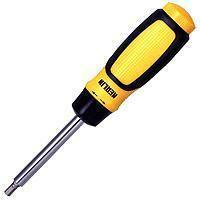 Optional driver bits 10 pcs are housed in a convenient magazine, store in the hollow handle.